This summer and fall, NOAA's Office of National Marine Sanctuaries is teaming up with Ocean Exploration Trust to explore the marine ecosystems of the West Coast and Hawai‘i. 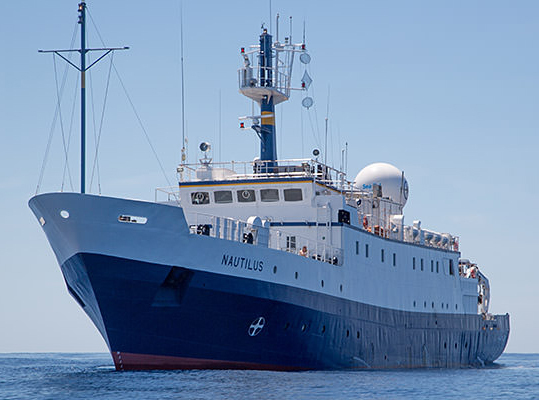 Working aboard the Exploration Vessel (E/V) Nautilus, scientists will map and explore targets throughout the U.S. West Coast from Canada to Southern California, and west to the Hawaiian Islands and Papahānaumokuākea Marine National Monument. Researchers will conduct mapping operations and use remotely operated vehicles (ROVs) to investigate Olympic Coast, Monterey Bay, and Channel Islands national marine sanctuaries as well as Papahānaumokuākea Marine National Monument in the Northwestern Hawaiian Islands. You can watch the livestream here. The NOAA Office of Ocean Exploration and Research provides support for the complementary ocean exploration program of the E/V Nautilus, which operates under a similar paradigm as the NOAA Ship Okeanos Explorer. The E/V Nautilus is equipped with telepresence, which will allow scientists from around the world to participate and contribute to the success of this mission. Plus, telepresence will bring the National Marine Sanctuary System and ocean science to the classroom, as students across the country will directly engage with mission staff and operations. For a full run-down of Nautilus' 2018 expedition plan and to watch live video, visit nautiluslive.org. Read on for details on the expedition's voyages into your national marine sanctuaries. You can follow the expedition on the NOAA Office of National Marine Sanctuaries social media channels, and check back here for updates, photos, and video as the expedition continues. On March 7, 2018, a large meteorite broke up and fell into the ocean about 15 miles off the coast of Washington. At the request of Olympic Coast National Marine Sanctuary, NASA, and the University of Washington, the E/V Nautilus crew mapped the area of the debris field and conducted an ROV dive to attempt to locate and recover meteorite fragments from the seafloor. Mapping and recovery efforts focused on an area of about one square kilometer (0.4 square miles) that was determined likely to contain the highest density of meteorite fragments. This short expedition included transit from Astoria, Oregon, to Sidney, British Columbia in Canada. Along the way, researchers used the E/V Nautilus’s EM302 multibeam echosounder and subbottom profiler at the site of the meteorite fall in Olympic Coast National Marine Sanctuary to document characteristics of the debris field. Using the ROVs Hercules and Argus, researchers located and recovered meteorite fragments with a variety of tools, including a specially-designed magnetic "rake." Recovered suspected meteorite fragments were rinsed several times in deionized water prior to being further tested. Confirmed meteorite fragments will be transferred to the Smithsonian Museum in Washington, DC, for curation as part of their research collections. This expedition also provided an opportunity to fill gaps in high resolution mapping of the seafloor along the ship's route. Map data at left courtesy of Dr. Marc Fries/NASA. Several seamounts in an unexplored part of Papahānaumokuākea Marine National Monument appear to have been formed by an unknown mechanism. This part of the expedition mapped and conducted ROV dives on these seamounts to help determine how and when they formed and to document the biological communities that presently live on them. 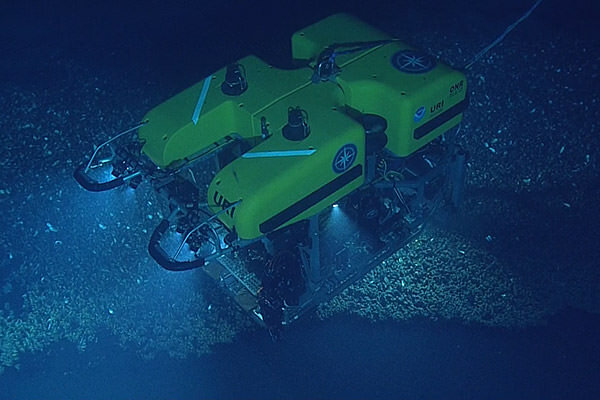 The seamounts are located between the Musicians Seamounts and the Hawaiian ridge and may be important to the connectivity between these two areas. The ROV dives surveyed these seamounts for the presence of deep high density coral and sponge communities similar to those found in the Musicians and on rift zone ridges on some of the Hawaiian banks. The ROV team encounters a gulper eel. During this part of the expedition, scientists will characterize an unexplored, deep-water (>10,000 feet) region within the borders of Monterey Bay National Marine Sanctuary. This area is a basaltic rocky reef southeast of Davidson Seamount. Researchers seek to characterize the habitat, species, and communities that live there. In 2009, Davidson Seamount Management Zone was added to the area protected by Monterey Bay National Marine Sanctuary, expanding the sanctuary area by 775 square miles to a total of 6,094 square miles. Driving Davidson Seamount’s inclusion in the sanctuary was the discovery of communities of long-lived deep-sea corals and sponges during collaborative expeditions by NOAA, Monterey Bay National Marine Sanctuary, and the Monterey Bay Aquarium Research Institute in 2002, 2006, and 2007. Although previous ROV dives have occurred on Davidson Seamount itself, there is unexplored deep rocky habitat southeast of the seamount that could harbor additional communities of corals and sponges. Through this section of the Nautilus expeditions, researchers intend to use the ROVs Hercules and Argus to document deep-water corals, sponges, and fishes, and collect biological samples. Researchers will also analyze water and sediment samples and collect environmental data that will aid in our understanding of the physical conditions of deep-water habitats. 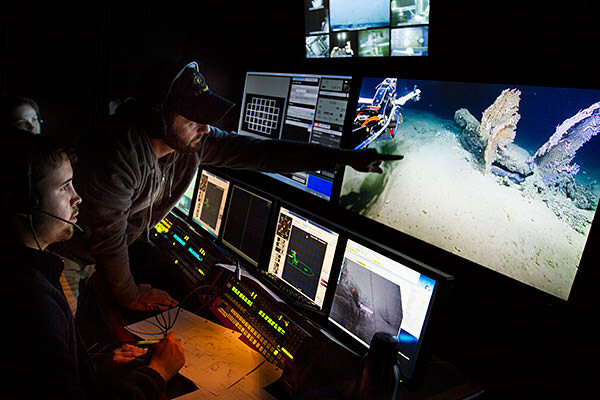 As part of the expedition, the Monterey Bay National Marine Sanctuary Exploration Center is working with Ocean Exploration Trust's renowned oceanographer Dr. Robert Ballard and his Corps of Exploration to bring real-time ship-to-shore telepresence interactions in the Center's auditorium. Dive into a 20-30 minute conversation with live presenters on E/V Nautilus and learn the exploration mission goals and recent deep sea discoveries. In 2016, Nautilus partnered with Channel Islands National Marine Sanctuary and mapped areas within and around the sanctuary. During one of the ROV dives, researchers discovered evidence of the location of an ancient shoreline – an indication of past sea level. During this part of the expedition, researchers will continue to identify and characterize the submerged shorelines associated with offshore banks in the Southern California region, including Channel Islands National Marine Sanctuary. This is a follow-on to the effort by Nautilus over the last four years to acquire high-resolution mapping data of submerged shorelines and characterize primarily with remotely operated vehicles. The Channel Islands region has a complex geologic history that includes initial formation by submarine volcanism 19 to 15 million years ago, platform rotation, and extreme regional uplift. This study will aid in understanding the complex sea level change and tectonic history of the northern Channel Islands and Channel Islands National Marine Sanctuary. Deep-sea coral communities, like the ones found in the national marine sanctuaries of the West Coast, are home to many diverse species. This curriculum takes students into the deep sea to identify the soft corals, hard corals, invertebrates, and fish found in these communities and to investigate the unique biology of deep-sea corals. Students also learn the threats these animals face and what we can do help protect them. This webinar archive provides an introduction to the Deep-Sea Coral Communities educational materials and hands-on activities.